Near this site, Captain Michael Doudel's company of York County riflemen mustered on July 24, 1775. Prior to their 600-mile journey to join General George Washington at the siege of Boston, Massachusetts. 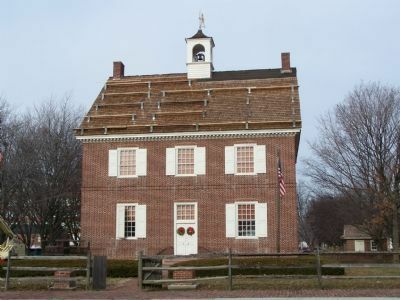 These frontier patriots were the first to answer the call to arms by the Continental Congress Resolution of June 14, 1775, authorizing the raising of 10 companies of riflemen. This was a beginning of what was to become under the Constitution, the United States Army. The York rifle company has existed continuously from its establishment and is perpetuated by today's 131st Transportation Company, Pennsylvania Army National Guard. Pershing Ave., on the left when traveling east on W. Market Street. Touch for map. Marker is in this post office area: York PA 17403, United States of America. Touch for directions. Other nearby markers. At least 8 other markers are within walking distance of this marker. In the Old Court House here at York (a few steps from this marker); York County (a few steps from this marker); York (within shouting distance of this marker); Golden Plough Tavern (within shouting distance of this marker); Gen. Horatio Gates (within shouting distance of this marker); General Marquis de Lafayette 1757 - 1834 (within shouting distance of this marker); The Four Chaplains (about 400 feet away, measured in a direct line); York County's 250th Anniversary (about 400 feet away). Touch for a list and map of all markers in York. More. 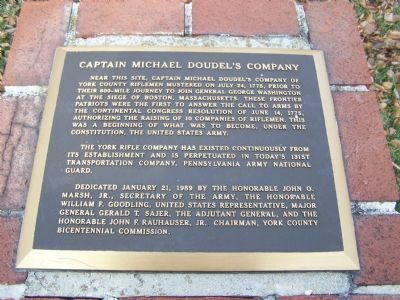 Search the internet for Captain Michael Doudel's Company. Credits. This page was last revised on June 16, 2016. This page originally submitted on January 6, 2008, by Bill Pfingsten of Bel Air, Maryland. This page has been viewed 1,254 times since then and 6 times this year. Photos: 1, 2. submitted on January 6, 2008, by Bill Pfingsten of Bel Air, Maryland.